Say No, Thank You, to Cavities With Homemade, Two-Ingredient Toothpaste! I guess that cavity bit in the title may be an exaggeration, as I did have my first cavity last year. But I’m an old lady, so it was probably bound to happen at some time or another anyway – regardless of what toothpaste I was using. I’m telling you, though, even when I go on vacation, I make myself a little bit of this stuff just to get me by. Fluoride just isn’t my thing, I guess you could say. I like to keep things simple and as chemical-free as possible. I also really like being able to replenish supply without running to the store. And you know by now that if there’s a way I can make it, I’m all over that, too! Let’s start today with one of my favorite things – a tutorial that will help you create something that will personalize your space in a major way! Of course, since I am fabric-obsessed, I appreciate the perfect curtain to complement a room. Matt and I moved out young and didn’t have anything beyond mini-blinds for years. When we bought our first house in our early 20’s, I was so jazzed to go curtain shopping! Finally, we’d be decorating a place the way we wanted to decorate it. 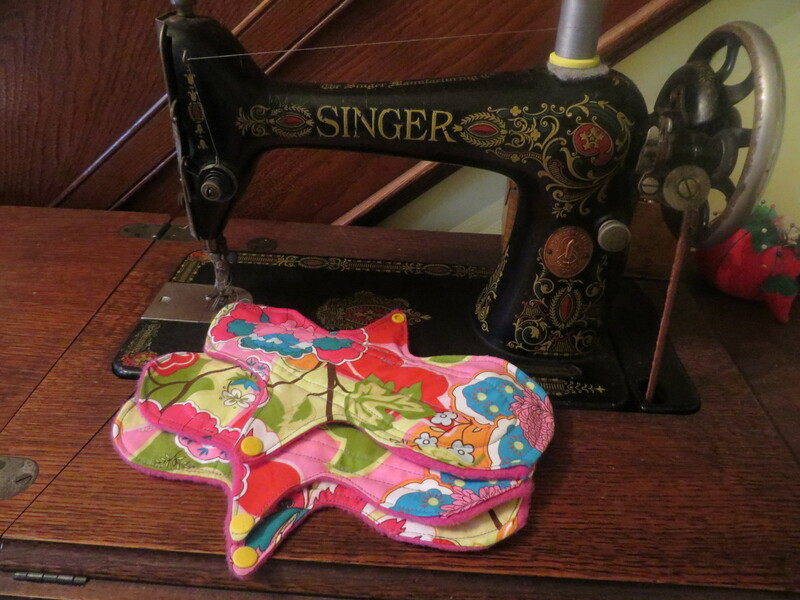 So last week A.S. decided that instead of buying Valentines for her friends at school, she’d like to use her new snazzy sewing machine (1934 Singer 99-13 hand crank) to make something for them instead. Of course, like any crafty mom would be, I was thrilled! 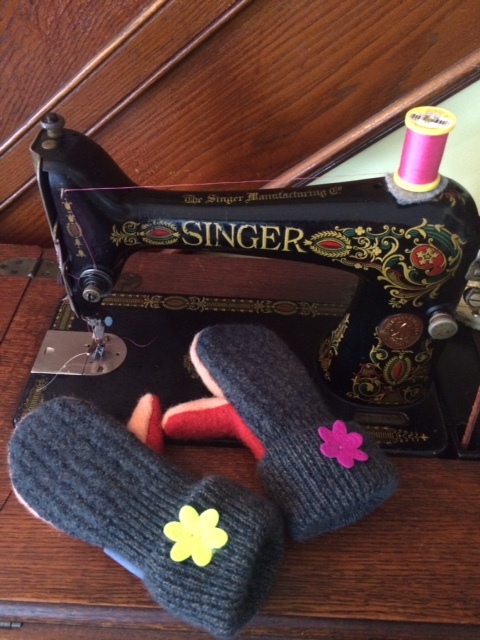 Do you ever see these gorgeous, boutique-style wool mittens that people are walking around wearing in the cold winter months and wonder where they get them? Want to make some for yourself?! For our family, it just made sense for us to transition to using only cloth paper towels. I was already using cloth diapers on the kids and cloth pads (search The Hippie Chick Menstrual Solution in the search box at right for more info on that) for myself. Let’s just say it was a journey, an evolution towards a more eco-friendly lifestyle – one baby step at a time. Luckily, everyone in the house was on-board (with a little resistance from Matt, who doesn’t do the laundry!). A couple years ago, someone gave me a link to a blog that had instructions on how to make homemade makeup — from crayons! If you know me in real life or are good at reading someone from what they say or do or how they talk, you should know that I hate unnecessary harsh chemicals. Makeup was one thing I could never see myself getting around. To be honest, I am of the age now where I regularly wake up looking “busted”! Ha, ha! But, really, I mean it. I need a little help in the morning, and coffee’s not going to cut it! I think today is the special day that I will finally write up the tutorial for the latest car seat poncho that I made. Both kids are sleeping in, and I have a few quiet moments to construct a tutorial that makes sense! I adore these ponchos. First off, I love them because I get to make them. A very close second is the fact that my kids just drool over them. A.S. would have one for every day of the week if she could. (And I might be crazy enough to sew that many if I didn’t anticipate my husband questioning all those extra fabric purchases!) As for safety, they are just so much better for car seat use than a big, bulky winter coat. Both A.S. and A.W. get in their seats, hold up their ponchos for me to buckle them in, and then drop the ponchos down to snuggle in. The fact that they’re reversible and fairly water-resistant when you use fleece are just added perks to their cuteness! I have seen many of these popping up from other crafty moms, so I think it’s a trend with some staying power. This morning started like many mornings in our household. A.W. and A.S. were fighting like cats and dogs about something in the playroom while I was making breakfast. I gave it a minute or two to see if they could resolve it themselves, but no such luck. When I stuck my nose around the corner to see the cause of the drama, I saw the tell-tale sign of loose strings of yellow yarn. For most women, having your period is a fact of life. Handling it with disposable products that end up in landfills and have fine print warnings of possible Toxic Shock Syndrome don’t have to be how you deal with it. There’s another option that no one is talking about! Let’s have some girl-talk! I can’t believe we are already in December! I am so excited to be doing this tutorial. I love making tutorials where you, my reader and craft partner, can make your own completely custom patterns for yourself. Frozen Anna Hat No. 2 – FREE Tutorial! Well, I am finally getting around to making the tutorial for the fleece Anna hat w/ the bonnet and braids. Finally! I always strive to keep my word, and it’s been bugging me that I didn’t put this up yet. 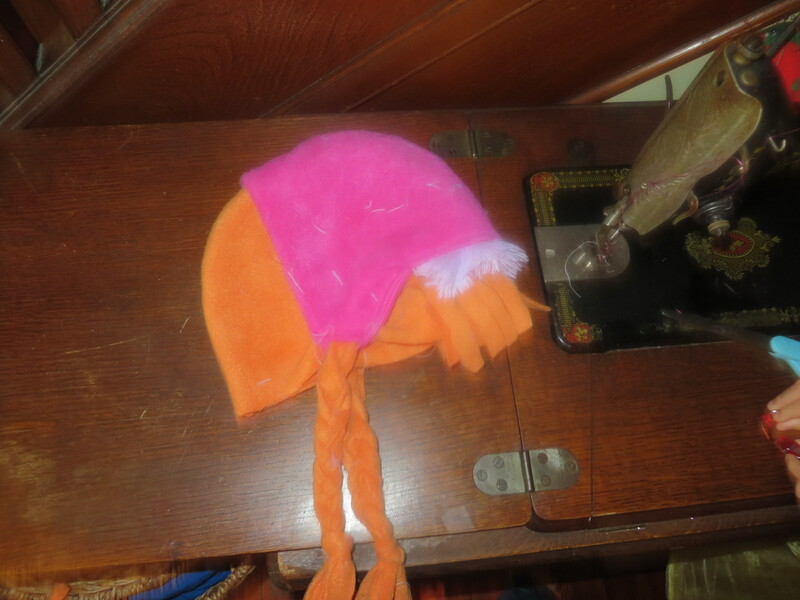 Also, I made this hat weeks ago; and I fear, if I wait too long, I won’t remember the steps I used to make the darned thing! Anna Hat No. 2 w/ attached bonnet. Thinking this might be great timing for a homemade Christmas gift for your little Frozen fanatic! Today was the first day in a long time that the kids and I didn’t have a schedule to keep. That usually makes for a crazy, disorganized, kind of all-over-the-place day; but today I had a plan! Actually, I’ve had this project in my mind for months now. Since moving in our house almost eight years ago, we have been doing nothing but home improvements. 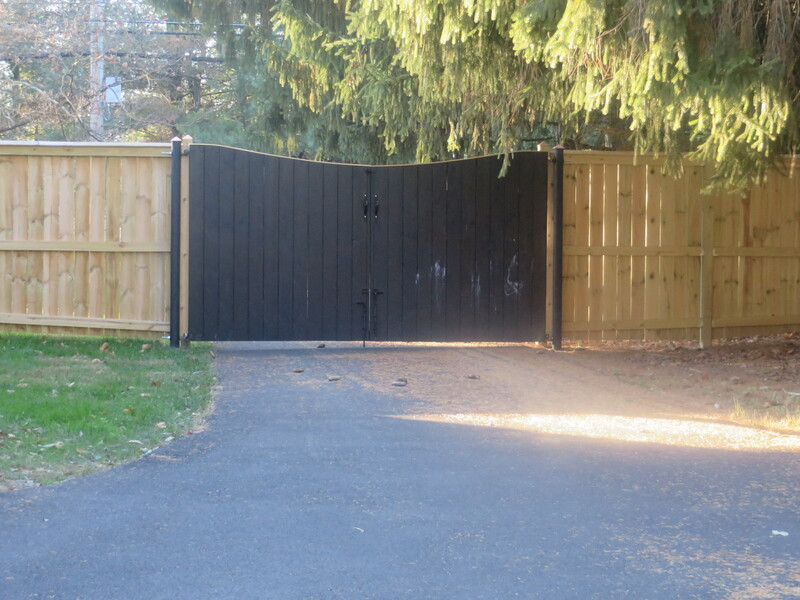 The latest major thing my husband built was a gate across our driveway. He is awesome and let my imagination guide the construction of the gate. I really wanted it painted black and a certain shape. Inside view of our driveway gate. It’s like a blank canvas that keeps calling my name! Literally the day I saw it finished and painted black, I came up w/ a mural for the inside of it. This side isn’t as showy and pretty as the side that you see when you pull up to the house, which is fine. But the sharp contrast of the black against the natural fencing had me immediately thinking of an all silver/white, whimsical winter theme. I actually drew it out in chalk and everything. (You can still see some of my chalk lines in the picture.) It was awesome! I had a large tree to one side that had no leaves left on it, the moon, and the silhouette of some snow-covered evergreens on a distant hill. And then I thought of my kids’ handprints as the leaves on the bare tree in the foreground. Triple 9-1-1 level awesome! Princess Anna from Frozen Cape Tutorial – FREE! After a solid week of my daughter asking me to make her an Anna costume, I decided that it would be a fun project, and a nice series to add to this blog. 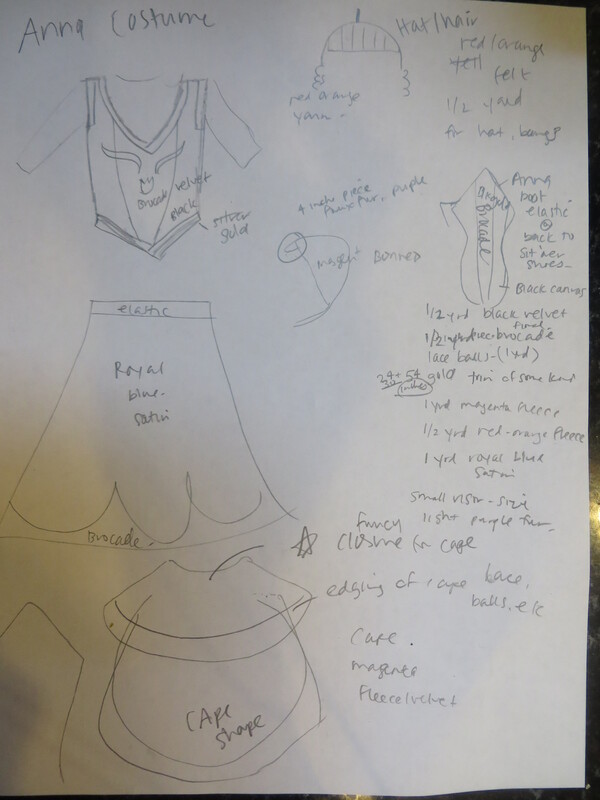 First sketch of Anna costume. Super-Duper Quick and Easy Anna from Frozen Hat Tutorial – FREE! We love the movie Frozen in our house, just like most other families w/ toddler girls who think they are princesses do! But the one line that is my daughter’s favorite of the whole movie is: The cold never bothered me anywhere [sic]. Since we are in the Northeast and approaching winter, that’s a big problem! But I have the solution, people! 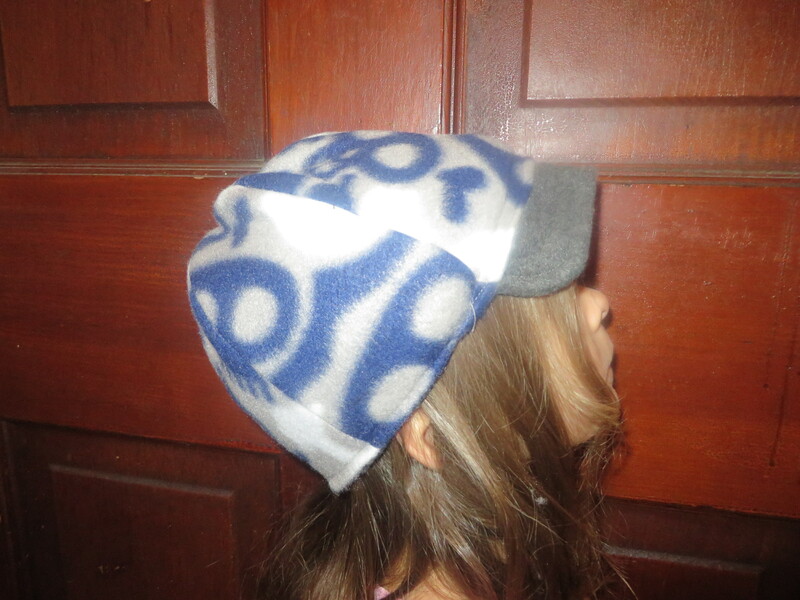 A functional Anna fleece hat. Two layers of fleece w/ Anna bangs and braids! Hopefully, no more fighting about wearing a hat. 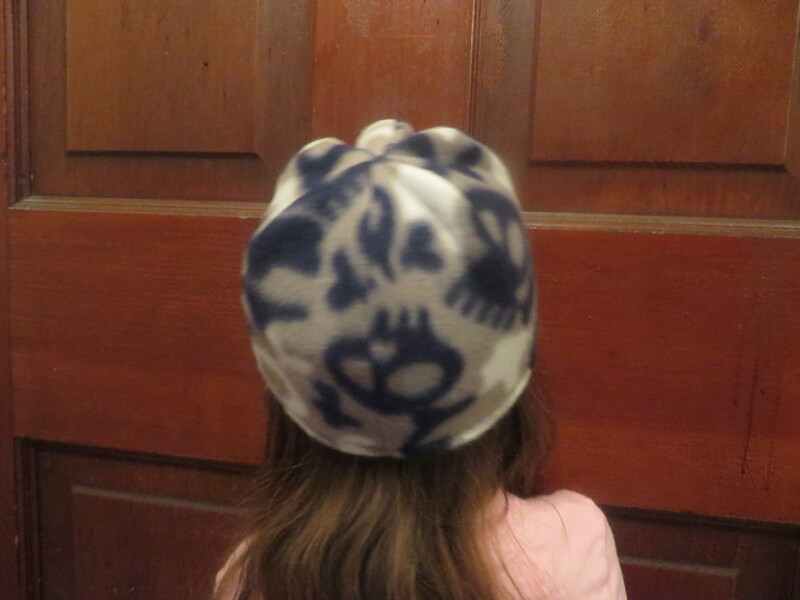 I can say that my daughter is wearing hers in the house, so I consider that a win. One point, Mom!